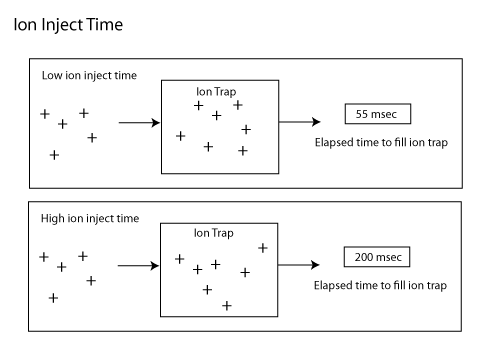 The Ion Inject Time is the time in milliseconds that it takes to fill the ion trap. The Ion Inject Time metric is the median time spent collecting ions for precursor spectra. Lower: Overall lower times may indicate an abundance of ions. A gradual drift upward over time in the Ion Inject Time may mean that the ion optics are dirty and thus are hindering the amount of signal reaching the detector. Or it could mean that the ion detectors may need to be examined and recalibrated. The MS1 Ion Inject Time measures the MS1 signal strength. Other measures of the signal strength are the Dynamic Range, the Peak Intensity, and the Total Ion Current.